Joe Mitchell's "Perspective" (Feb. 11, 2019). Last week Donald Trump gave his second State of the Union address. It was the longest such address in almost 20 years. In an 83-minute monologue, Trump talked about the booming economy, low employment, and the historic number of women in the House. Two former drug offenders were highlighted for their excessive prison sentences that a new prison reform bill will address. Yet there was no mention of Jason Van Dyke’s light sentence after being convicted of second-degree murder and sixteen counts aggravated battery with a firearm in the death of Laquan McDonald. There was no mention of the five Houston police officers wounded while serving a drug warrant, the multiple acts of domestic terrorism, and no policies or bills were outlined to help address poverty or assist the poor in this country. Trump is right -- we do have a national emergency and it has nothing to do with the southern border. America has Americans without adequate access to healthcare, employment, shelter, and education. Instead of building a wall, let’s build a bridge out of poverty. I’m Joe Mitchell and this is my perspective. I admire the leadership of Bobby Seale and Huey Newton, the co-founders of The Black Panther Party for Self Defense, in Oakland, California. The organization was started in 1966 to bring awareness to -- and protect Black people from -- police brutality in their communities. Huey Newton, who earned his PhD from the University of California, Santa Cruz, studied the gun laws of California and educated other Panthers about how to arm themselves legally to protect their families and friends from the illegal actions of Oakland police. A DeKalb-based church is cautioning local residents not to respond to private investigators believed to be working to verify the residency of students. The DeKalb School District was sued in October for allegedly enrolling around 1,000 students who don’t live in the district. The school board introduced a private-investigating firm at a previous meeting, but didn’t confirm the investigators would be used to verify residency. 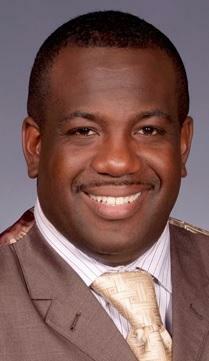 Joe Mitchell is Senior Pastor of New Hope Missionary Baptist Church. He worries use of private investigators may be an attempt at racial profiling. A DeKalb group based at New Hope Missionary Baptist Church held an informational meeting outlining its opposition to a DeKalb School Board decision to investigate whether some students live outside district boundaries. Why Make The Children Suffer? On May 7, Attorney General Jeff Sessions addressed the Association of State Criminal Investigative Agencies on the topic of immigration enforcement. Every fourth Thursday of November, this nation celebrates Thanksgiving. A holiday centered around a peaceful, but fictional, feast of the native Wampanoag tribe and English Pilgrims fleeing religious persecution. This make-believe communal meal happened only once, before the Pilgrims began to annihilate the natives.